Quick Note: If you are viewing this exhibit on a mobile phone, turn your phone sideways for a clearer view of The Looks! Adore it? Or wouldn’t be caught dead in it? For centuries women have squeezed, padded, and puffed up their bodies to fit different shapes, or silhouettes, that were fashionable. From massive sleeves to enormous backsides; from wide bell-shaped skirts to straight-and-narrow shifts—the look of the moment has always been in flux, changing along with societal roles and norms. 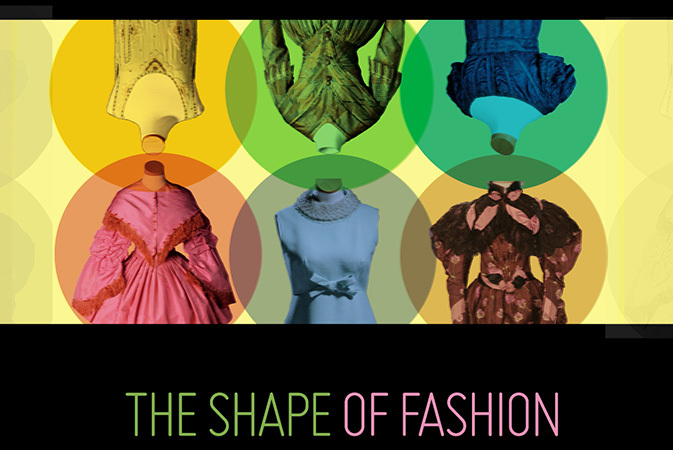 The Shape of Fashion explores how these fashionable silhouettes changed over time, particularly in women’s clothing, by introducing visitors to 10 very different “looks” from the 1800s and 1900s. 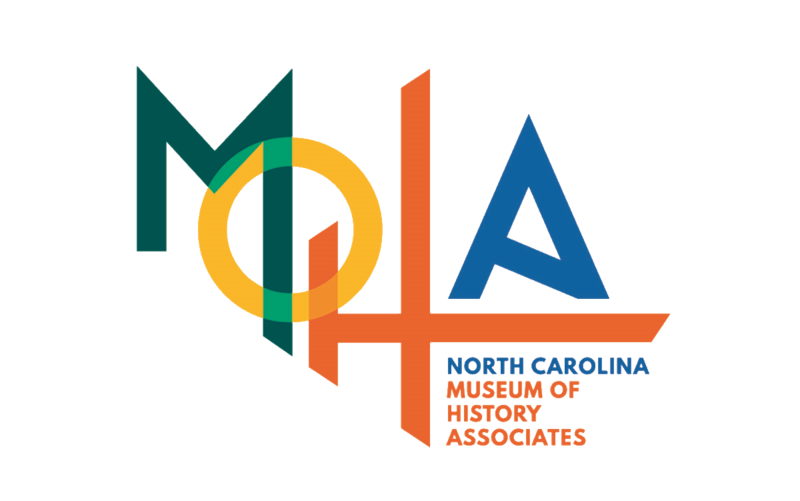 The exhibit featured more than a dozen period garments that were once worn by North Carolina women, men, and children, as well as many photographs of additional pieces in the museum collection. Big changes in society can lead to big changes in fashion. After decades of artificially wide hips and tightly laced torsos, a major shift begins to occur at the end of the 1700s. Americans, believing their newly formed government embodies the ideals of ancient Greek democracy and the Roman republic, embrace a fashion for Greco-Roman decorative arts. Even women’s clothing begins to mimic the flowing robes of ancient statuary. - Short, slightly puffed sleeves or long, narrow sleeves topped by a puffed sleeve cap. - Very high waistlines (known in modern fashion as an Empire waist) with fabric dropping loosely to the floor from slightly below the bustline. - Often white or pale colors; made from lightweight fabric. 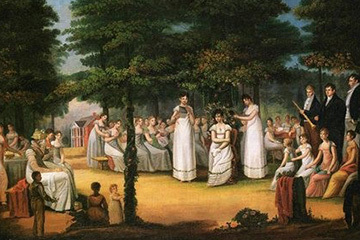 Raleigh artist Jacob Marling depicted these Raleigh Academy students, dressed in typical early 1800s attire, in an 1816 painting, The May Queen (The Crowning of Flora). Everyday dresses that are worn around the home are made of relatively plain cotton or linen. Work clothing is constructed from more hard-wearing materials, like coarse-woven linen or wool. Fancier dresses are made from silks and other finely woven fabrics, and they often contain small amounts of lace and other trimmings. Humans may claim to crave simplicity, but their innate need to apply adornment never seems to stay contained for long. By the mid-1820s, skirts widen into an A-shape. Dresses feature ruffles, applied braids, or other decorations on the bodice and in a wide band above the hem—and sleeves begin expanding to enormous proportions! When it seems they can get no wider, they start constricting, especially along the upper arms. At the same time, waistlines drop, bodices move toward a deep point at the natural waist, and skirts continue to grow wider and fuller. Sometimes technological innovation gives fashion a helping hand. As skirts grow larger and larger in the 1840s and 1850s, their fullness must be supported by multiple layers of petticoats or, eventually, crinolines—stiffer, stronger petticoats, often made with horsehair. A patent for the steel-wire “cage” crinoline, or hoop skirt, is granted in 1856. By eliminating the need for multiple layers, this innovation offers women a relatively lightweight way to support even larger skirts. Fashion has its ups and downs, and when a trendy shape has become as big as it can get, a deflation is surely on the way. By the 1860s, skirts have become so wide that they can obstruct women’s movement. Before long, elliptical hoops begin shifting fullness to the back of dresses, and by the late 1860s, so much fabric has accumulated there that a new silhouette is born. Women begin wearing bustles—collapsible wire frames, metal contraptions, or padded bum rolls—to support the weight of, and show off, this new look. Sometimes fashion moves quickly. After more than a decade on top (or, literally, in the back), the bustle abruptly falls out of style. Instead, sleeves become the next (really) big thing. While skirts keep a slight fullness in the back, fashion moves toward an hourglass shape, with wide shoulders above a tiny, corseted waist that is balanced out on the bottom by widening skirts. Sleeves reach their peak fullness around 1896, with many large enough to need internal stiffening to help maintain their shape. Occasionally, a fashion change touted as beneficial can look awfully uncomfortable in hindsight. Around 1900, a new S-shaped profile silhouette emerges in which the bust is thrust forward, while the hips and shoulders are forced back. The corset that helps achieve this look is proclaimed “healthy” since it elongates the waist and does not tightly cinch the abdomen and internal organs, as earlier corsets had. The S-curve may look extremely restrictive to modern eyes, but after 1910, corsets will become even longer and straighter. Within a few decades, they drop out of use, ending the notion of contorting women’s bodies to create the latest fashionable shape. Significant cultural changes often inspire new fashions. The tubular silhouette that emerges after World War I is something entirely new for the quickly evolving “modern” world. Curves and frills are out, and a slim, androgynous, youthful look is in. While many women still wear corsets, their purpose is now to flatten and smooth the body, not cinch the waist or enhance the bust or hips. This straight-sided look offers freedom of movement and de-emphasizes the traditional female shape just as American women are taking on new roles in society and gaining the right to vote. World War II plays a significant role in dictating women’s fashion in the 1940s. The look of the moment is inspired by military uniforms, with nipped-in waists and shoulder pads that create broad shoulders. Many women’s suits differ from female military uniforms only in color and in minimal decorative elements. Fabric rationing restricts the amount of fabric available for outfits and also affects style—especially by raising hemlines. While war can bring fashion change, the years following a conflict are just as likely to shift the silhouette. After fabric rationing ends and men return from fighting in World War II to resume the factory jobs women had performed during the war, clothing assumes a look that is touted as a return to classic femininity. But this “New Look”—a phrase first used to identify dresses in Christian Dior’s 1947 line—is only new when compared to the more masculine, military look of the 1940s. In other ways, it harkens back to the mid-1800s with skirts that have become full again and waists that are cinched with tightly tailored bodices. Some looks are so striking that they never really go away. One of the most iconic and recurring shapes of the 1900s and 2000s is the sheath. These short, straight, sleeveless dresses, first worn in the 1920s, come into their own in the 1960s. Today, we consider the sheath a “classic”—so much so that no matter the current trend, you could still walk into a clothing store and purchase one that would not look out of place in the 1960s.